We saw that superstar Rajinikanth can single-handedly bash up a hundred villains in Kabali. The film made his fans go crazy and how. Next year, he will face a solid villain in the form of Bollywood hunk Akshay Kumar. 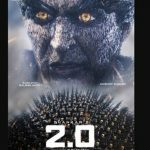 Yes, we are looking forward to Enthiran 2.0 for a variety of reasons. It has superstar Rajinikanth as a scientist and Amy Jackson is his love interest. It also marks the debut of Akshay Kumar as a villain down South. Today, we got a great piece of news. Yes, famous stunt choreographer Stunt Silva revealed that the climax and fight sequences of Enthiran 2.O have already been shot. The film is expected to hit the marquee in April 2017 and everyone is damn excited about it. Stunt Silva shares a great rapport with filmmaker Shankar Shanmugham and superstar Rajinikanth. He has worked as a body double for Rajinikanth in Sivaji (2007). In the interview, he revealed that Shankar is his mentor and Godfather in the industry. Rajinikanth has begun shooting for the film after a break of two months. He was having health issues. In fact, he is all set to shoot for a song with Amy Jackson. The Brit beauty also confirmed it in a tweet. Shankar is known to shoot songs first but his modus operandi is different this time round. 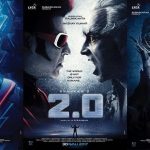 Actress Aishwarya Rai was the female lead in the original Robot, this time Shankar roped in Theri actor Amy Jackson who is quite popular down South. 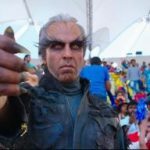 Bollywood actor Akshay Kumar will be playing the antagonist.He plays Dr Richard who turns into a crow as a result of a wrong experiment. In this sequel Rajinikanth will make a thundering comeback as Vaseegaran, the robotics scientist. The makers and technicians have confirmed that it is not a sequel to Robot. 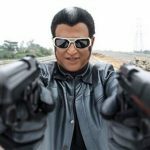 Resul Pookutty told a portal much earlier, “Folks who have already seen Enthiran, might relate to this story more but there’s no chance that people who haven’t, will not be able to make sense of the present story.” Also Read: Rajinikanth’s look in Enthiran 2 revealed!